Paul Morphy was born on June 22, 1837 in New Orleans, Louisiana. He had two sisters, Mahrina, born in 1830, Helena born in 1839 and a brother Edward born in 1834. His father's nationality was Spanish, but he was of Irish origin. His mother was French. From the age of 8 he played hundreds of games against the best players in New Orleans. By the time he was 13 he was considered to be the best chess player in New Orleans and one of the very best players in America. At age 17 he won 6 games against judge Meek, President of the American Chess Congress. Apart from this, he only faced relatively weak players. In October, 1857 Morphy went to New York to play in the first American Chess Congress. The top 16 players in America were invited. Morphy easily defeated them all and won the event. He refused the $300 first place money. Instead, he accepted a silver pitcher, four goblets, and a silver tray. He defeated Charles Stanley, the next best player in America, giving him odds of pawn and move. Morphy gave the $100 prize money to Stanley's wife and children. As a mark of gratitude, she named her next daughter Pauline. After Morphy's amazing victory at New York, some suggested that a European master should come to America to play him. When the great British master Howard Staunton, who was considered the world's best player at the time, heard this, he wrote in his weekly paper column, "The best players of Europe are not chess professionals, but have other and more serious things to occupy their minds with." His friends in New Orleans did send a challenge to Staunton to come to America. But Staunton rejected it. He did say that if Morphy came to Europe, he would find him ready. In June, 1858 Morphy went to challenge their best chess players. The New Orleans chess club suggested that they pay him the amount needed for him to participate in the Birmingham tournament, to be held in England, but he declined the offer, as he did not want to be considered a professional chess player. He stayed in England for 3 months trying to arrange a match with Staunton. But Staunton claimed he had more serious things to do, albeit he participated in the Birmingham tournament at the same time. Staunton also continued to smear Morphy in his newspaper chess column, claiming that he was just chasing money. In the last letter that he sent to Staunton, he writes "Allow me to repeat, what I have constantly declared in all the chess circles I have had the honour to participate. That I have never wanted to make any skill I may possess, a tool for making a profit". Morphy had to give up the idea of a match against Staunton and went to Paris, where he defeated Lowenthal, Harrwitz, and Anderssen within a space of six months. Having defeated Harrwitz, he even rejected receiving the prize of 290 francs. But he was forced to, and later and in an act of true generosity, used it to pay Anderssen's journey to France. When he arrived in Paris to play Anderssen, he was suffering from flu. His medical treatment consisted of being leeched. He lost four pints of blood and was too weak to leave his hotel bed. When Anderssen's friends asked him why he did not play as brilliantly as he did in his famous match against Dufresne, Anderssen replied "Morphy would not let me." So it was that Morphy came to play the second strongest chess player in the world from his hotel bed suffering from the flu, and still won the match with a 7-2 score! Mr. Staunton's conduct is a warning that cannot be entirely lost on men not utterly depraved, who are tempted into petty duplicity to serve petty ends; and in the midst of all, how Paul Morphy's modesty, dignity of carriage, generosity, and entire honesty of purpose shine out and make us proud to call him countryman! Exploits and Triumphs in Europe of Paul Morphy. The Atlantic Monthly, vol. 4, issue 24 (October 1859). When Morphy returned to New York, he was greeted by Longfellow, Oliver Wendell Holmes, Samuel Morse, and John van Buren, the former President's son. Van Buren toasted him as 'The Chess Champion of the World.' It was the first time that expression had been used. Nonetheless, for Morphy it was a bitter disappointment that a match against Staunton had eluded him. He was paid $3,000 to write America's first chess column for the New York Ledger newspaper. He did this for a year and then quit. He was the first sports figure to issue a commercial endorsement when he declared of a watch, "I have examined the contents of this watch and find it to be made of 100 percent genuine machinery." In April, 1859 he played up to 8 blindfold simultaneous games against the top players of each chess club he visited [see game against Freeman below]. By December, 1859 he had given up serious chess. He attempted to practice law but failed. He suffered a total breakdown when a lady spurned his offer of marriage stating that she would not marry a "mere chess player". By this time he became a psychotic and suffered from delusions. He traveled to Cuba, then to Paris in 1863. He returned to New Orleans a year later. In 1867 his mental state was causing some alarm. His mother persuaded him to go to Paris, hoping that the change of would help him. Morphy had now come to hate chess, and he never approached the chess clubs where had earlier celebrated his greatest triumphs. He stayed in Paris for 18 months before returning to his home. It was around now that Morphy withdrew from society and suffered delusions of persecution in his later years. According to his niece, he had in a period the strange habit of walking up and down the porch saying "He will plant the banner of the Castille on the walls of Madrid, screaming: The city is conquered and the little king will have to go." Two years before Morphy died, he was asked if it was okay to include him in a book about famous Louisiana citizens because of his achievements in chess. 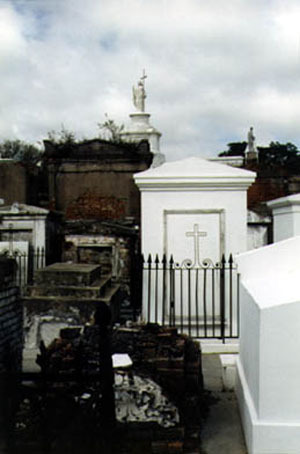 He was outraged by being connected with chess, and answered, that his father, judge at the supreme court of Louisiana, Mr. Alonzo Morphy, at his death, had left a sum of $146,162 dollars and 54 cents. He imagined himself persecuted by his relatives and went into a state of seclusion. He thought his food was poisoned or that someone was out to kill him. He once attacked a person in the street and challenged him to a duel to the death to settle an imagined wrong. On July 10, 1884 Paul Morphy died of a stroke while taking a cold bath. He was just 47 years old. He had played 227 competitive games during his lifetime, winning 83%. In an interview in former Yugoslavia, Grandmaster Bobby Fischer commented on Paul Morphy saying: Morphy...I think everyone agrees(!! )...was probably the greatest of them all. This game is like finding an old fossile. It faintly resembles a modern Sicilian and shows something of its prehistory. One of my favourite variations the Lasker-Sveshnikov (or the Pelican or whatever you want to call it) was still undiscovered and the heroic battles of Sicilians' to come was still seventy years or more away. 1.e4 c5 Morphy commented here: Against such an adversary as LaBourdonnais, the disastrous effects of MacDonnell's early moves in nearly all of the Sicilian games...could not be overcome even by the very best after-play. The move of 2 Nf3, or still better, 2 d4, are those now generally recognized as the best. The latter move is, indeed, so strong that it has gone far toward disabusing the public mind of that pernicious fondness for the Sicilian Defence which was displayed during what may be called the period of close games, extending from about 1843 to some time after 1851. It was an epoch of uninteresting games and dreary analytical labours, and with the exception of the contests occurring between the great Prussian masters, afforded but comparatively few specimens of brilliant play. It should be a subject of rejoicing with every lover of the game that an age in which so much sever labor led to such unprofitable results has passed away. There is now a visible tendency to cultivate a higher style of chess art - to substitute for the false taste which has so long prevailed a more elevated standard of excellence. Indeed! So we are living in a dark age of dreary analytical labours! 2.d4 cd4 3.Nf3 Nc6 4.Nd4 e6 In his book on Morphy, Sergeant added a question mark to this move. 5.Nb5 d6 6.Bf4 e5 7.Be3 f5 8.N1c3! One reason why Morphy was so much better than his contemporaries was that he understood better than they the importance of quick development. 8...f4 Tartakower, in his book 500 master games of chess, Dover; 1952) analyzes the following: 8...fe4 9 Ne4 d5 10 Qd5! ; or 8...a6 9 Nd5! wit the idea of Bb6 and Nc7; or 8...Nf6 9 Bg5 a6? [9...Be6 is better. If 10 Bf6 gf6 11 Qh5?! Bf7 12 Qf5 a6 13 Na3 Nd4 14 Qh3 d5! However, 11 ef5! Bf5 12 Nd5 Rc8 13 Qf3! Bc2 14 Nf6 Ke7 15 Nd5 Ke8 15 Bd3 with advantage - R. Forster] 10 Bf6 gf6 11 Qh5; or 8...Be6? which Tartakower considered best, 9 ef5 Bf5 10 Nd5 Rc8 11 c3 a6 12 Nbc7 Kd7 13 Bb6 Nf6 and White is clearly better. Forster, however, found 14 Na6 Qe8 15 Nc5! winning. 9.Nd5 fe3 10.Nbc7+ Kf7 11.Qf3+ Typically, Morphy prefers the initiative over mere material gain. 11...Nf6 12.Bc4 Nd4 13.Nf6+ d5! Anderssen puts up a stout defence. 14.Bd5+ Kg6? The enterprising try 14...Be6 15 Be6+ Ne6 16 Nfd5+ or 14...Ne6 15 Ng4+ just loses the a8 rook without compensation. With 14...Ke7! the game is very complicated; Morphy has three pieces en-prize! 15 Qh5 gf6! 16 Qf7+ Kd6 17 Na8 Nc2+ 18 Ke2 Qe7! 19 Qe7 Be7 20 Rac1 Nd4 21 Ke3 Bd7! and if now white plays 22 Bb7, then 22... Rb8 23 Bd5 Rb2 with an unclear position. Analysis by Zuckertort and Maroczy. Interestingly no mention is made of 17.fe3!? Nc2+. If 17...Qc7 18.Qf6+ and 19.Qh8. 18.Ke2 Rb8 19.Rc1 Bd7. If 19...Nb4?? 20.Nb5++. 15.Qh5+ Kf6 16.fe3 With the opening of the f-file Black's King is doomed. 16...Nc2+ 16...Qc7 is much better. After 17 ed4!, Tartakower says that White is winning but this is still unclear after 17...Ke7!. Probably 18 0-0 is best (18 0-0-0 was recommended by Tartakower) with a very powerful attack. Notice that if White tries 17. Rf1+ Black blocks the f-file by playing 17...Nf5. 17.Ke2 1-0 The end comes suddenly. After 17...Qc7 18 Rhf1+ Ke7 19 Rf7+ Kd8 20 Rc7 Kc7 21 Rc1. The following is game played by Morphy on his twelfth birthday against his uncle. 1. e4 e5 2. Nf3 Nc6 3. Bc4 Bc5 4. c3 d6 5. O-O Nf6 6. d4 ed4 7. cd4 Bb6 8. h3 h6 9. Nc3 O-O 10. Be3 Re8 11. d5 Be3 12. dc6 Bb6 13. e5 dx5 14. Qb3 Re7 15. Bf7+ Rf7 16. Nxe5 Qe8 17.cb7 Bb7 18. Rae1 Ba6 19. Ng6 Qd8 20. Re7 1-0. If 20. ...Nd5 21. Nd5 Re7 22. Nf6++. The game was evidently approaching its termination. Mr. Paulsen, who generally thinks out to its last his every move, deliberated half an hour and then moved, and then with a slight flush upon his face sat quietly awaiting the consequences. Morphy, pale, collected, and yet with a look of restrained - although entirely restrained - nervousness, looked steadily at the board for about one minute, after which his hand opened very far back, so that the knuckles were very much the lower part of it, poised over a piece for a second or two, and then swooped quickly down and moved it somewhat decidedly, which is his usual way of moving. He remained intently looking at the board, which Paulsen studied for a few minutes, equally absorbed. Looking up at last, the latter quietly said to his opponent - "I don't see how I can prevent the mate." Paul Morphy smiled, waived his hand deprecatingly, and the tournament was won. The checkmate was just a few moves off, if we remember rightly. Restraint of this kind seems to be imposed by a thorough study of this noble game, and its moral discipline is quite as valuable as the sharpening of the intellectual faculties which it accompanies. Ahhh!! The old virtues! Restraint. There isn't much of that these days is there? Certainly not off the chess-board. I must confess that it had never occurred to me before that a study of chess imposes a kind of moral discipline. Maybe this is a good argument for more chess in schools! The point about the sharpening of the intellectual faculties is, perhaps, not made very often these days. I for one aren't sure about this. It would be nice if it were so, but I think it sounds a little like the idea behind teaching Latin grammar - it isn't a living language but the process of studying it will be good for one's intellectual development. Discuss. 1.e4 e5 2.Nf3 Nc6 3.Nc3 Nf6 4.Bb5 Bc5 5.O-O O-O 6.Ne5 Re8 7.Nc6 dc6 8.Bc4 b5 9.Be2 Ne4 10.Ne4 Re4 11.Bf3 Re6 12.c3 Qd3 13.b4 Bb6 14.a4 ba4 15.Qa4 Bd7 16.Ra2 Rae8 17.Qa6 Qf3! 18.gf3 Rg6+ 19.Kh1 Bh3 20.Rd1 Or 20.Rg1 Bg2+ 21.Rg2 Re1+ 22.Qf1 and Black mates. 20...Bg2+ 21.Kg1 Bf3+ 22.Kf1 Bg2+ 23.Kg1 Bh3+ 24.Kh1 Bf2 25.Qf1 Bf1 26.Rf1 Re2 27.Ra1 Rh6 28.d4 Be3 0-1. If 29.Be3 Rhh2+ 30.Kg1 Reg2++. 9...d6 10.Qb5 Re8 11.Qb3+ d5 12.f3 Na5 13.Qd3 de4 14.fe4 Qa4+ 15.g3 Re5+ 16.Kf7 Qe7 17.Nd2 Re3 18.Qb5 c6 19.Qf1 Bh3 20.Qd1 Rf8 21.Nf3 Ke8 0-1. Schulten - Morphy. New York, 1857. 13...Re2! 14.Ne2 Nd4 15.Qb1 Be2+ 16.Kf2 Ng4+ 17.Kg1 Nf3+ 18.gf3 Qd4+ 19.Kg2 Qf2+ 20.Kh3 Qf3+ 21.Kh4 Nh6 22.Qg1 Nf5+ 23.Kg5 Qh4++. 0-1. 1 e4 e5 2 Nf3 Nc6 3 Bc4 Bc5 4 b4!? Bb4 5 c3 Ba5! Probably best. 5...Be7 has had a couple of interesting try outs recently: Kasparov - Anand, Riga 1995 (1 - 0, 25) and Shirov - Timman, Biel 1995 (1 - 0, 28). I really don't know if anything new has come up after that. 6 d4 ed4 7 e5? d5! 8 ed5e.p. Qd6 9 0-0 Nge7 10 Ng5? Better is 10 Ba3 10...0-0 11 Bd3? Black should take a leaf out of Morphy's book and develop. 11...Bf5! 12 Bf5 Nf5 13 Ba3 Qg6 14 Bf8 Qg5 15 Ba3 dc3 Winning very easily. 16 Bc1? Marache is obviously keen to under-develop! 16...Qg6 17 Bf4 Rd8 18 Qc2 Ncd4 19 Qe4 Ng3!! 0 - 1. 20.Qg6 Nde2 is mate! 1 e4 e5 2 Nf3 d6 3 d4 Bg4? A common mistake, repeated by several of Morphy's opponents, even by Harrwitz in the last game of their match and some of my opponent's at Felixstowe Chess Club! 4 ed Bf3 5 Qf3 de 6 Bc4 Nf6? 6...Qd7 is best. After 6...Qf6 7 Qb3 White is clearly better. 7 Qb3! 7.Qe7 Harrwitz played 7...Bd6. 8 Nc3?! 8.Qb7 was possible, but Morphy turned it down because of 8...Qb4. The obvious 8 Bf7+ Qf7 9 Qb7 Ne4 10 0-0! or 9...Bc5 10 Qa8 Bf2+ 11 Kf2 Ne4+ 12 Ke1 Qf2+ 13 Kd1 Qd4 14 Nd2 or 14 Bd2 winning is what Morphy would have played against any strong player. When playing poor opposition he plays something inferior because he was constantly 'fishing around' for a brilliancy. In this game he finds it. I think that these lines also illustrate just how careful one has to be even when one's opponent has played badly. How many club players, playing White would even bother analysing after 8.Qb7? 8...c6 9 Bg5 b5? Hopeless - just DEVELOP!!!! 10 Nb5! Nice, but not at all difficult for Morphy. 10...cb5 11 Bb5+ Nbd7 12 0-0-0 Rd8. Now Morphy has what he has been looking for; a sparkling finish! 13 Rd7! Rd7 14 Rd1 Incredibly this has been repeated recently in a game in Spain in 1994 between GM Amador Rodrigues - Mu–oz!! No! I am not joking! 14...Qe6 (Mu–oz played 14...Kd8. He lost in six more moves. 15 Bd7 Nd7 16 Qb8! Nb8 17 Rd8 1 - 0. Pretty. Surely one of the most famous and elegant finishes to a game in the entire history of chess. What else has Morphy left to sacrifice? That surely is a measure of it's brilliance. Morphy - Freeman. Part of an 8-board simultaneous blindfold display, Birmingham 1858. 1 e4 e5 2 Bc4 Bc5 Now 2...Nf6 is considered mandatory. 3 b4?! Bb6?! 3...Bb4 4 c3 Be7! is indicated by ECO as slightly better for black. 4 Nf3 d6 5 d4 ed 6 Nd4 Nf6 7 Nc3 0-0 8 0-0 Ne4! 9 Ne4 d5 Now try following this when you don't have sight of the board! 10 Bg5 Qe8? Better are 10...Qd7 or 10...f6. 11 Bd5 c6 12 Re1 12...Qd7 13 Nf6!! An incredible move in a sighted game let alone a blindfold one. 13...gf6 14 Bf6 Qd6! 14...Qd5? 15 Re5. 15 Ne6!!? 15 Be6! was suggested by Steinitz. There is also 15 Bf7+! (15...Rf7 16 Re8+ Rf8 17 Be7! 15...Be6! Or 15...fe6 16 Qg4+ Kf7 17 Qg7+ Ke8 18 Be6! Bf2+! 19 Kf2 Qd4+ 20 Kg3! Qf6 21 Bg4+ Kd8 22 Rad1+ wins. Incredible variations - but how much of this did Morphy see?? 16 Qh5? 16 Qd2! (Maroczy) is stronger, avoiding 16...Qf4. If 16...Bf2+ 17 Qf2! cd5? 18 Qe3. 16...Bf2?+ 16...Qf4 was still preferable. 17 Kh1 Qf4 18 Re6 Nd7? 18...cd5! was the last chance. 19 g3! fe6 20 gf4 Rf6 21 Qe8 with a double-edged position. 19 Bb2! Bd4 If now 19...cd5 20 g3! Bg3 (20...Nf6 21 Bf6 fe6 22 gf4) 21 hg Qg3 22 Re3! winning. 20 g3?! I certainly would not know that the queen has no good square after this small move. Remember that he is playing eight games blindfold. However, 20 Re4! (R. Forster) is better) 20...Nf6 21 gf4 Nh5 22 Bd4 Nf4. Or 22...fe6 23 Be6+ Rf7 24 Rg1+ Kf8 25 Bc5+ and Rg8. 23 Rg1+ Ng6 24 Rgg6+! Allowing 24...fg6 24...hg 25 Rg6+ Kh7 26 Rg7+ Kh6 27 Be4. White emerges with a won endgame. 27...f5 28 Bd3 b6 29 Rg3 Rf7 30 Be5 Re8 31 Bf4+ Kh7 32 Rg5 Re1+ 33 Kg2 Rg7 34 Bf5+ Kh8 35 h4 Rg5+ 36 Bg5 Re8 37 Kf3 1 - 0. Surely one of the truly great blindfold games in spite of the mistakes. A really wonderful effort. Don't forget he was playing eight other games at the same time - all without sight!! Wherever one places Morphy in the list of all time greats there is no denying his genius. Steinitz said of this game that it was truly beautiful. An excellent game by the unknown Dr. Freeman, although Milne Edge claimed that the famous French master, Saint Amant was running from table to table, giving advice to Morphy's opponents!! If this is so it makes Morphy's achievement all the greater. Barnes - Morphy. London, 1858. Thomas Barnes was a strong English player. He also had a terrific record against Morphy with eight wins and nineteen losses. 1 e4 e5 2 Nf3 d6 3 d4 f5?!! The Philidor counterattack. 4 de5. ECO recommends 4 Bc4 and 4 Nc3 with White advantage. If 4 Nc3 after 4...fe4 5 Ne4 d5 6 Ne5! de4 7 Qh5 g6 8 Ng6 Kosten suggests 8...hg6 and after 9 Qh8 Be6 10 Qe5 Qd5 11 Qd5 Bd5 he concludes that black is at least equal. 4...fe4 5 Ng5 d5 6 e6! 6...Bc5? 6...Nh6! maybe best. ECO recommends 7 Nc3 c6 8 Nge4! Now theory indicates that 8...de4? losses after 9 Qh5+ g6 10 Qe5 Rg8 11 Bg5! 7 Nf7!? Both 7 Nc3 and 7 Ne4 are stronger according to theory. 7...Qf6 8 Be3?! According to Staunton this is a mistake. He recommended 8 Qd2. 8...d4 9 Bg5 If 9 Nh8 de3 10 Qh5, but after 10...g6 11 Qh7 [11 Qc5?? Qf2+ 12 Kd1 e2+]. 11...ef2+! (11...Qg2 12 Kd1 Be6 is less clear) 12 Kd1 Be6 black has a powerful position. 9...Qf5 10 Nh8 Qg5 11 Bc4 Nc6. 11...Qg2 was supposed to be better. However, R. Forster has found that 12 Qh5+ g6 13 Qh7! Qh1+ 14 Kd2! gives white a winning attack. 12 Nf7? There was no time to save this piece. Morphy now, in a few moves, generates a, probably, decisive attack. 12 0-0 was necessary. 12...Qg2 13 Rf1 Nf6 14 f3? Now black wins very easily. White is trying to avoid 14...Ng4. Maybe he should have tried 14 Nd2 Ng4 15 Bd5!? 14...Nb4 15 Na3 Be6! 16 Be6? Nd3! Neat. 17 Qd3 Forced since if 17 cd3 Bb4+ wins on the spot. The rest is easy. 17...ed3 18 0-0-0 Ba3 19 Bb3 d2+ 20 Kb1 Bc5 21 Ne5 Kf8! With the idea of Re8 - e1. 22 Nd3 Re8 23 Nc5 Qf1 24 Ne6+ Re6 0 - 1. Morphy's most memorable games, in the main those where he is playing vastly inferior opponents, have a certain charm. He overwhelms his opponents because they are so much weaker than him. He was obviously a huge talent; how many of his opponents, for example, could have played eight players blindfold simultaneously. But it isn't just talent. The particular quality that makes him special; the thing that sets him apart from everyone else is that he is ahead of his time. He possesses knowledge about the key importance of development. He avoids some of the simple minded recklessness of his opponents that today even an average club player might be embarrassed about. It is these facts which make him such a significant figure for those authors who write books aimed at the novice player. Morphy's game figure prominently in such books. I have seen it written on numerous occasions that one of the best things someone new to the game can do is play through a selection of the games of Paul Morphy. Who has not played through his game against the Duke of Braunschweig and Count Isouard played in a Paris Opera house. This surely would be most people's candidates for the most famous game ever played. Morphy's best known games have a charm and a wit which makes them memorable and vivid. There is nothing we like more than see how he takes apart an opponent who has neither his talent or understanding of the game's principles. But although, for the most part, his adversaries have been largely forgotten by history (what else did the Count and the Duke achieve in their lives apart from play that game in the Opera house)! They still deserve our respect, for without their unique contribution these games would not have been possible. But, putting this to one side, perhaps, being ahead of one's time is precisely what talent actually consists of, well at least in part. Morphy's success rests on both of these facts, perhaps in equal measure. Ability and a grasp of principles which almost all his contemporaries lacked. How do we go about assessing Morphy as a player? He existed in what has been described as the pre-history of the game. This makes him sound like a kind of dinosaur, although that, perhaps, should attributed to the age rather than the man. At any time all one can do in a game or a sport is to take on board what all one's fellow players are doing, the state of the game's theory and so on and play in a way that works and achieves the best results. That is exactly what Morphy did with extraordinary success. The fact that many of his opponents were pretty feeble, at least by modern day standards is hardly something we can lay the blame for at his feet. Nevertheless, all these points make assessing Morphy and comparing him with modern masters and saying just how good would he have been if he had been born a hundred years later impossible. It makes Fischer's comment: Morphy...I think everyone agrees(!! )...was probably the greatest of them all, seem all the more bizarre even by his standards. Who was he to say: I think everyone agrees? Really? What made Fischer say this? Did he consult his fellow professionals? I doubt it! The evidence is to say the least, tenuous. The game has changed out of all recognition. The understanding and dissemination of the game's principles has been transformed. Of course measuring him against modern masters is about as pointless an exercise as measuring the great tennis stars of the thirties against the likes of Sampras or Agassi; or measuring the great thoroughbred racehorses of today against those of the seventeenth and eighteenth centuries. One measure of greatness we can use, however, which we can use with a great deal of confidence is to ask the question: How great was the gap between Morphy and his contemporaries? How does that compare with the gap between, say, Lasker and his contemporaries, or between Alekhine and his contemporaries, or between Fischer and his, or Kasparov and his? I think if we use that measure it is clear that Morphy was a great player. After all in other sports, do we think any the less of Rod Laver, or before him, Fred Perry because the sport of Tennis has advanced so much and so far beyond the standards which existed when they were both at the top? We can, it seems to me, do no more than adopt the standard of greatness that existed at each age. For his time Morphy was a great player; for his, so was Capablanca, so was Alekhine, Botwinnik, Fischer, Karpov and Kasparov. That's all we can do. We can compare two players only providing the standards of the time are similiar and this normally means they achieved their best results at roughly the same time. That means we can compare Karpov to Kasparov fairly easily. But when the standards are utterly different; asking the question: who was the greater: Morphy or Alekhine; Morphy or Fischer; Morphy or Kasparov seems to me to be a pointless and time wasting exercise. Morphy was an extraordinary player in an age of primitives. He has been described as the King of Neanderthals, it is very difficult to know how strong he could have been in our times. I doubt he would have had the nervous strength and the love for hard work required for a modern world champion. As for his dislike of money: Allow me to repeat, what I have constantly declared in all the chess circles I have had the honour to participate. That I have never wanted to make any skill I may possess, a tool for making a profit. Well he would certainly have not liked the game today!